I am so beyond excited that Zara has announced that it will be opening it’s flagship store in Downtown Los Angeles next spring! I can just imagine my husband’s excitement at me coming home with bags and bags of new Zara gear every time the store stocks up new stuff. I’m already at the City Target weekly checking it out – Lord help my bank account once Zara comes to town!! According to the LA Times, it will be a massive 27,000 square foot space, making it one of the largest in the USA. Oh it will be heavenly. Young professionals like me who both live and work in Downtown LA need shopping options. We literally have no place to buy clothing downtown (and no – I don’t consider the Macy’s a viable option!). With Urban Outfitters opening in the fall, we’re making some real progress downtown! I moved here less than a year ago and already the city has expanded immensely! (City Target, Le Ka, Coco Laurent, Ross all opened up here). It’s always been my main complaint about living in Downtown LA that there is no place to do shopping nearby – it takes 30 minutes to drive 10 miles to The Grove and then takes another 30 minutes or so to get to The Americana (Glendale), and if I need to go to Sephora and Zara, I need to make 2 separate trips as The Grove and Americana don’t have both. I know…. #firstworldproblems. But it’s totally an issue. Since I have the luxury of walking to work, the thought of getting into my car to shop just seems wasteful to me. 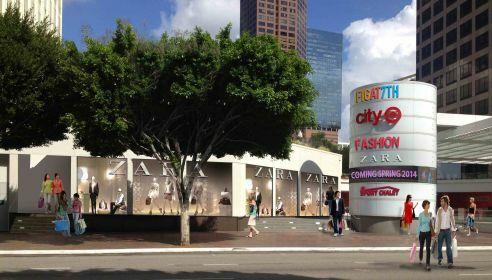 I wonder what non-DTLA residents think – would you fashionistas drive to Downtown LA to go shopping at the new Zara?